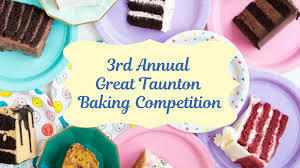 Details: Taste cakes from talented Taunton-area bakers or enter the competition yourself! Enter your cake (or cupcakes!) using a favorite birthday cake recipe for judging to win a special prize and bragging rights. TO ENTER: --Just let us know ahead of time so we can be sure to have enough supplies available for the eating! You can Facebook message, call us at 508.822.1622 or send an email to info@oldcolonyhistorymuseum.org. --On May 4, please drop off your entries by 12:45 p.m. Judging will start at 1 p.m. with eating to follow. --The theme is "OCHM's Birthday" so we suggest either a 9-inch cake or a dozen cupcakes. --Entries are judged for taste, creativity, and design by a panel of 3 judges. --You will be asked to present your entry to the judges and explain what you made. --A prize (informal and fun) will be awarded to the winner, and then everyone will get to eat the results! TO ENJOY: Come by any time between 1 and 4 on May 4th. To celebrate our birthday we open up the Museum for free! So bring some friends, enjoy the exhibits, taste some cakes, and we hope you have a fun afternoon at the museum! Anyone with a business in baking is welcome to bring business cards to display. Home bakers are entirely welcome and encouraged! Please let us know if you have any questions!